Yesterday we got a surprise visit from a great friend! 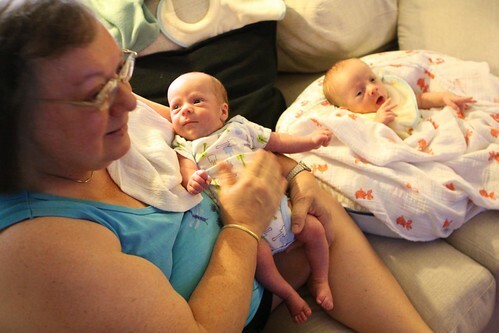 Melanie came to visit the babies for the first time. Okay, it wasn't really much of a surprise. In fact I drove her here from the city after work where we got stuck behind some jerks at a stop light who flipped me off. Other than that it was a total surprise! Today was a very special day too. It was my mother's birthday, my parents' anniversary, and the Wombats' one month birthday. Overall there was a lot to celebrate. While I wanted to just come home, eat some macaroni and cheese, and go to bed, that just wouldn't be sufficient in celebrating all these milestones. When I came home the boys were just chillin'. Their new thing, apparently, is that they eat and just stay up until their next feeding without sleeping at all. This is a wild departure from what we've grown accustomed to. Our dinners, which have been interrupted 100% of the time by shrieking babies, have continued to keep up that perfect record. 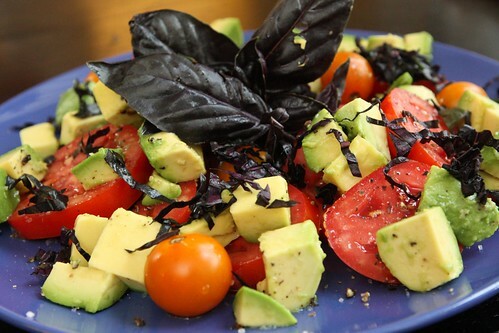 I started this evening by making a salad with the farm tomatoes, avocado, and Opal basil (also from the farm). 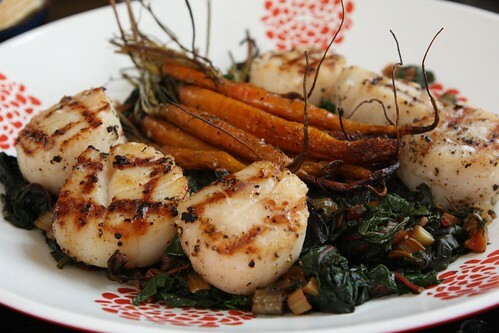 For the main course I roasted the baby carrots from the farm, cooked up the Swiss Chard with Walla Walla onion and garlic, and grilled some beautiful sea scallops. My new trick with the Swiss Chard is to chop up the stems and cook them before adding the greens. Not only does it add some volume to the rapidly wilting chard but it adds a nice bitterness to the final product that works very well. For a drink I had this Lucky 13.alt Lagunitas Brewing Company. 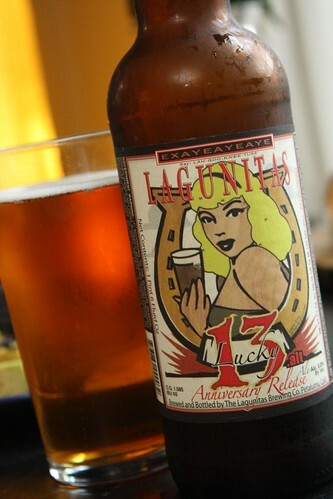 Their 13th anniversary beer was such a hit with the Lagunitas staff that they new brew it each and every year. This is my first year having it and I was very impressed. At 8.8% in a 22 ounce bottle it is a little dangerous so I only drank most of the bottle as I am responsible for two tiny human beings this evening and I wanted to remain somewhat responsible. 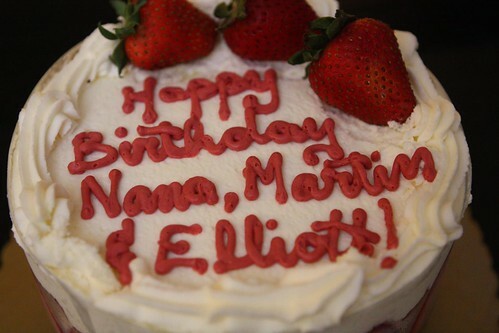 For dessert we celebrated all the birthdays with a nice strawberry shortcake to commemorate my mother's birthday and the babies' first month on planet Earth. We had some fun testing the babies' walk reflexes tonight but were unable to get them to perform on video. It would have been nice to post a video here to show their walk reflex in action but unfortunately all we have are a half dozen videos of me dragging their feet across my chest with perplexed looks on their faces. After dinner we gave them a bath and dressed them in their Coming Home outfits. They fill them out quite nicely now at over seven pounds each. This makes it much easier for their mommy to delight in dressing them like little French sailors. Thankfully there aren't any other babies around to beat them up. Wombats. LOVE that description. Bob and I are enjoying your updates thoroughly in a "been there done that and look how cute they are sort of way"...I can't believe that you are still making such fabulous meals. I would be eating yogurt out of the tub and ordering take-out. Nice going! Soon they will sleep like movie babies and all of these hard nights will fade into the recesses of your memory. That's why people do this more than once. sometimes. I think I can only keep up on the meals while we have help. Even with help I need to stop 2-3 times to attend to various baby needs. They have an uncanny knack of waking up the second we sit down to dinner. Perhaps in another few weeks they'll be still a little longer and allow me to continue meals on the blog. If not it will be all I have to write a quick post about them, have a beer, and go to sleep. Readership will DEFINITELY be on the rise if that's what my life becomes.